On any Sunday, at the heart of Brick Lane, where all the food stalls cluster upon the railway bridge, you will find eager gamers around Carrom boards, absorbed in their games, and you can guarantee there will be a crowd of spectators too, mesmerised by this fascinating sport from India that is a curious blend of Billiards and Drafts. Played with discs upon square wooden boards coated in french chalk, the objective is to knock you opponents counters into the pockets at each corner. If you look closely among the throng you will spot the cunning genius responsible for this spontaneous flowering of a vibrant game culture that has complete strangers of diverse backgrounds playing together across the table every week. Slight of build, with spidery limbs and lanky hair – a man who greets everyone as a friend – this understated presence is Carrom Paul, President of the Carrom Association of the United Kingdom. 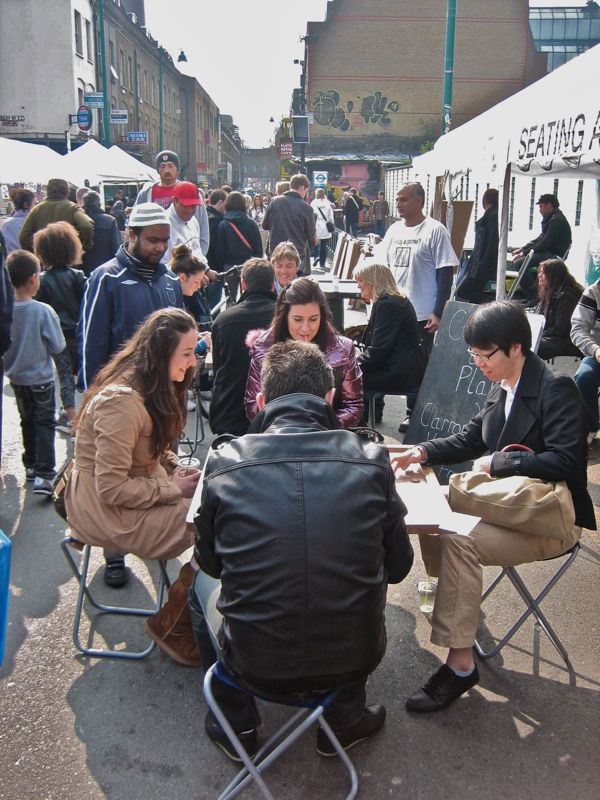 “One day fifteen years ago, I went to Ealing and I saw these game boards that I’d seen in India, so I bought four and brought them back to the Spitalfields Market and set them up for people to play, but it got so big I had hassle from the other stallholders. I was selling religious artifacts then, and once I sold the Carrom boards, I thought I wouldn’t get any more. But this old Indian man came along and explained that the pockets at each corner are the four great religions of the world, Islam, Hinduism, Christianity and Judaism, and when all the religions meet in the centre there will be peace and the moon will turn red, represented by the red counter at the centre. 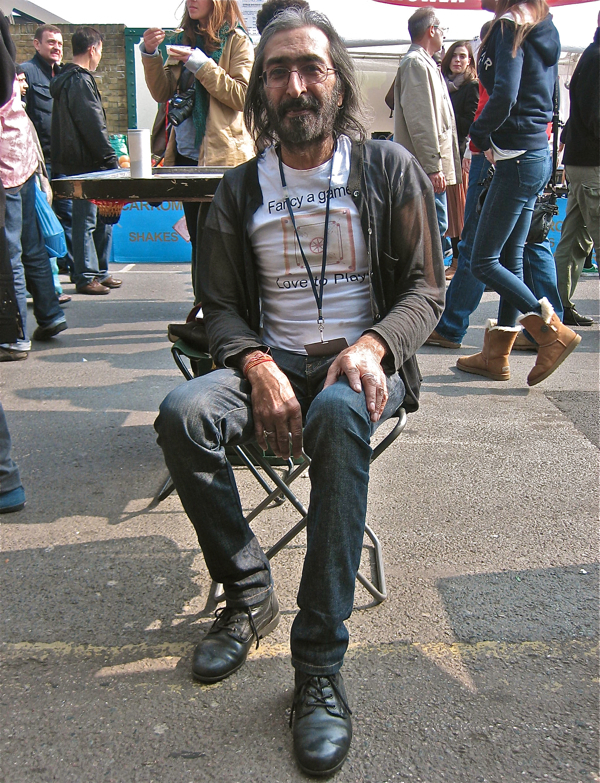 Gentle Paul comes up to Brick Lane from Tunbridge Wells every weekend. He takes the day off on Monday, does his website orders for Carrom boards on Tuesday, delivers them on Wednesday, and spends Friday and Saturday preparing for Sunday. Now he has a mission to get Carrom declared an Olympic sport, and since Billiards, which is a derivative of Carrom, has already been listed, he has high hopes of success. It certainly is a beautiful spectacle Carrom Paul has conjured on Brick Lane, an unlikely haven where anyone can sit down and play for free. He paired me with Robbie, a passing white-haired gentleman to try a friendly game, just to learn the ropes and develop our technique for flicking the counters, and by the end of the game – which I found unexpectedly relaxing – we had become friends. It is a perfect Sunday pass time, civilised and egalitarian, with subtle religious overtones. I love carrom as it has childhood memories for me, from when we visited relatives in India during my childhood. I was never very good; never developed the proper technique of firing the pieces without hurting my fingernail half the time. I bought an inexpensive carrom board back with me a few years ago but haven’t played. Will have to go and visit and watch the players, skilled and new, for a few hours. 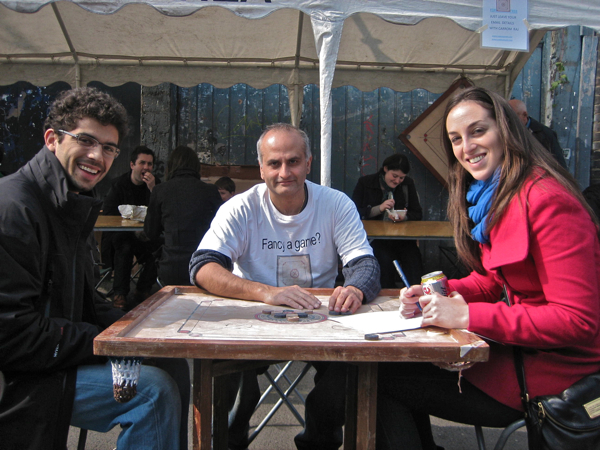 How wonderful…will definitely pay Brick Lane a visit on my next trip back…just so that I can have a go and learn the game of Carrom. If you are in Sweden, welcome to Svenska Carromförbundet! The Game of the Gods is very addictive! Do you know any Carrom Rehab centrtes yet? I see you like Palolem, one of the better beaches in Goa! I remember buying lots of boards from you well over ten years ago when you were trading at Spitalfield market. It was to start a Carrom club at Bangabandhu Primary school. I had no idea then of the meaning of the four corners and the coming together of all religions, but it’s a wondeful symbol which I heartily support. When I saw you’d been moved from the covered market to the street I felt a bit sad as people playing are a bit more challenged by the elements. But you don’t appear phased by it. Nice to see that this Game of Carrom in the market of Spitalfields.Hats off to all persons associated directly or indirectly with this.The game spreads like this only.My best wishes to one and all. My name is shofique Miah i dont know if you can recall me playing Abdul Khan in carrom final back in 2002 and got a runner up prize of £200 and a certificate, its nice to see you live and kicking in Brick Lane with your carrom boards. At present i’am working in indian restaurant and recently been checking carrom on line after work, i have lost my touch of play as i have not been playing for a very long time, but for some reason my mind and fingers are aching for a game of carrom. i’am planning to visit you at Brick Lane for a game and to see you and say hello. Are you still organising any competitions? Great to see someone so passionate about Carrom. I am a recent convert, but met with Alkesh and Manessh from Synco Carrom, and now sell Synco Carrom here in the UK. I hope you are still there in Spitalfields. If so, I will come and see you there. You are in the Video on YouTube. I remember well. I was so happy that kids can learn early and maybe play interschool games and become great Carrom Players. I went to Brick Land market today and asked around looking for your carrom stall. A friendly man playing chess with passers by said you had left a few years ago because of eye problems. I was disappointing to hear this, I hope you are doing well. 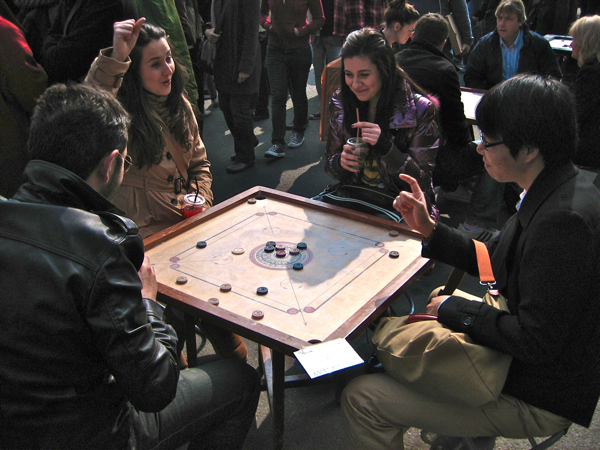 Do you have any ideas where carrom can still be played in London? Just wondering if there’s anywhere that carrom is still being played in London?